Our team is now back into the swing of things after attending the MYOB annual Partner Conference 2016 on the sunny Gold Coast. We loved catching up with all our networks, partners old and new as well as the MYOB staff and crew. It is mind blowing at how fast each year rolls by, particularly when you hear some partners being awarded 10, 15 and 20 years of service! It was only seems like yesterday that we met some of them! We had the honour of meeting and being mesmerised by a true Australian – Michael Crossland. An inspirational speaker with the gift to touch people’s heart through his ability to express feelings in such a way that resonates with you. His story about his life challenges and adversity and how he manages to overcome most of these by giving back and helping others through acts of kindness. As he often states ‘do something your future self would be proud of’. His way of achieving success inspired me to look for and appreciate a different way of life. A truly remarkable young man. There was such a buzz in the air at the gala dinner, it was a RIO theme with fabulous, food, drink, music, lights, laughter and loads of fun! MYOB announced a fundraiser on the night to support Michael Crossland’s charity – Frontier Projects and with the generosity in the room we raised a phenomenal $60,000 plus!! During the gala dinner MYOB celebrated many partners with recognition and service awards. Once again, we were awarded Victoria’s Top Sales Partner as well as National Top Sales Partner for 2016. 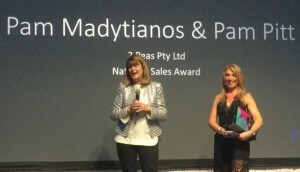 We were humbled by this accolade and our warmest congratulations go out to our entire group at 2 Peas Pty Ltd. We are blessed to have such a fabulous team! 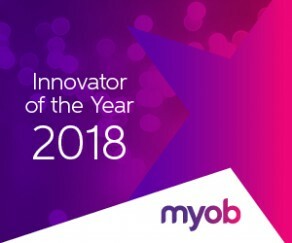 We also extend our sincere congratulations to all the other state winners and to Martine Hoosen who won this year’s Partner of the Year, MYOB Newcomer Jen Pryor, Pam Chilman for her Lifetime Achievement award and of course our Melbourne colleague Kamara Wagstaff for her Innovator award. Congratulations also to the Add-On winners Tanda and Neto. The event hosted an array of trade stands with some of the latest add-on software that extend functionality to the main stream accounting products like MYOB Essentials, MYOB AccountRight Live as well as Xero and QBO. It was wonderful to get to know the people behind the add-on business. 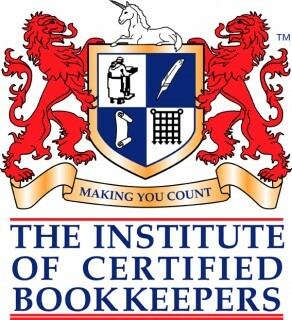 The use of innovative solutions a business can easily create automation as well as growth. At 2 Peas we love to review new products coming to market that can value add to our client’s business. We have our own rating system with these products to ensure our clients achieve the best possible outcome. Employee timesheets and payslips with Your Pay Employees can now complete timesheets on the go, the timesheets are uploaded automatically back into MYOB, emailing of payslips directly to employees. Working with bank transactions enhancements with rules in bank feeds. MYOB will be enhancing online payroll in future releases including: Custom Payroll Categories, Long Service Leave, Public Holidays, Leave Loading, Unpaid Leave, Overtime, Time in Lieu and RDO. The ability to search all sorts of search criteria within the card files. For example: search for contacts with specific post codes, last contact dates, addresses, ABN numbers, identifiers and custom lists. The ability to apply grouping to the search criteria i.e. group card type by customers, suppliers and employees. You will also have multiple levels of grouping. Filter search criteria as well i.e. if you are trying to look up which suppliers didn’t have an ABN number you can filter to remove all blanks. Similar to how you filter in excel, the filter button in AR Live will be similar. Ability to customise the filtering – this feature is very similar to conditional filtering in excel. For example: if you want to see when you last contacted your customer you can search for last contact date and make the date less than a specific date. This will give you a list of customers that require follow up. Reporting – You can copy the search criteria to the clipboard and then open it in excel. Ability to lodge BAS within MYOB – (release date not confirmed). Better short cut keys – These are already in the product if you hold down the Alt key it will highlight the short cut key within each command centre. This is worth sharing as it is the little things that we don’t know about that count. New fresh look – MYOB are changing the look of the product to give it a fresh more modern look and will over time extend this to all screens. It is great to be a part of an Australian institution like MYOB. We are excited with all the new technology and updates coming to market. Our business is passionate about being in the forefront of change so we can continue to offer our clients the best possible service, software and solutions!